Turn your creative ideas into embroidered reality! New & Exclusive! CorelDRAW ® Essentials 4 Software inside! Over 500 embroidery designs included. Automatic digitizing, specialty stitch effects and more! Let your ideas become embroidery reality with DesignerPlus or EditorPlus. Or rediscover the pleasure of exploring your embroidery dreams with the V6 Update. Software take embroidery to a new level. 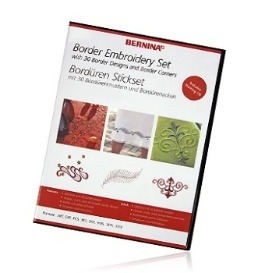 The BERNINA CutWork Accessory together with the BERNINA CutWork Software gives your BERNINA embroidery system the power to cut shapes, patterns and designs from single or multiple fabric layers. Cut sharp, crisp edges quickly and easily. Staying on the cutting edge can be sew much fun! This add-on calculates borders perfectly, then embroiders them. Embroider borders galore - around the corner or in a circle! Calculate borders perfectly, then embroider them! A reflection of your style and creativity! 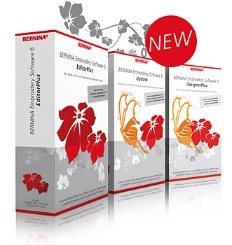 Create your style with BERNINA and My Label - the exciting pattern-fit software! Visualize the style on your own 3D model. An assortment of built-in styles become YOUR personal pattern when you enter your measurements into the software and watch the 3D model morph to your measurements. Design your own clothing stitch by stitch! My Label offers 20 classic patterns than can be customized in a variety of ways using My Label software. Enter your measurements and watch the 3D model change to reflect how the style will look on you. See your reflection before you even begin sewing! 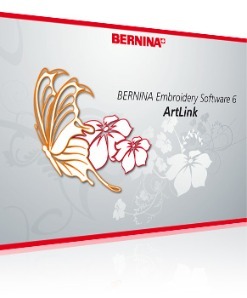 Free download of ArtLink 6 embroidery software to add to your BERNINA sewing and embroidery system. This basic software will make it easy to turn your first embroidery projects into reality.